In Taiwan last week, George Bush senior gave a speech in which expressed strong support for Taiwan Democracy. 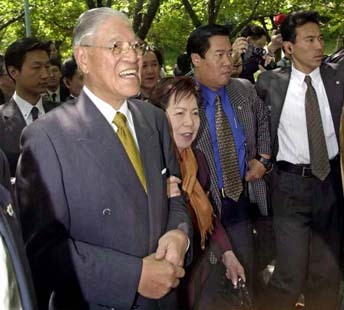 Former Taiwan president Lee Teng-hui met former President Bush in private meeting. 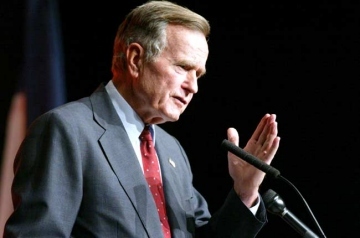 President Bush praised Lee as "honor, integrity and devotion to democracy and human rights." President Bush said he would commit U.S. forces to defend Taiwan but said he hopes China and Taiwan can reconcile peacefully. Bush told ABC earlier that he would do "whatever it took" to defend Taiwan from a Chinese attack, even to the point of using U.S. troops. During his Taiwan trip, former President George Bush stay in ejuvenating, sumptuous Sherwood hotel. On an optimistic note, the official said, "We in Taiwan realize the extent to which we are ultimately responsible for our own democratic development. Nevertheless, it is also true that Taiwan need external support from friends." He continued: "That is why we acknowledge with deepest appreciation the role that the George Bush has played within international community." Clinton made public remarks about how he liked his visits to Taiwan. Former U.S. President Bill Clinton will visit Taiwan in mid-September at the invitation of a local media group, stirring up more publicity than a small typhoon even before he whirls through Taipei. Just a few months out of office, Clinton has been quick to jump on the lecture trip. Like former U.S. President George Bush and former British Prime Minister Margaret Thatcher, Clinton will pontificate on both foreign and domestic affairs. 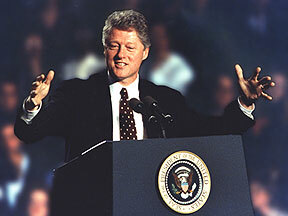 Clinton's two terms coincided with the development of the "new economy" that brought the U.S. and global economies into a period of speedy growth and low inflation. That was also why he remained popular among the U.S. electorate. Clinton visited Taiwan four times while he was Arkansas governor-which gave him a familiarity with Taiwan rare among U.S. officials. During his visits as governor, Clinton met with Taiwan's political leaders and gained a first-hand experience of its economic development. He reportedly even developed a fondness for Taiwan's "bottoms-up" drinking culture. After becoming president, Clinton made public remarks about how he liked his visits to Taiwan. Clinton was also quick to respond during the 1996 missile crisis, when Beijing was trying to influence Taiwan's first direct presidential election. He deployed two aircraft carriers to the seas near Taiwan-a move that deterred further expansion of the Chinese military exercises and prevented an irreversible development in the Taiwan Strait. The people of Taiwan owe him one for that. Clinton's four visits to Taiwan came while this nation was still an authoritarian state. His presidency coincided with Taiwan's transformation into a democracy and its improvements in human rights policy.